First day at bug school came to review at exactly the right moment for us as shortly little Ned will be starting reception. I think this might be more of a pivotal moment for me than him, but this book does help celebrate starting school and makes for brilliant bedtime reading. We loved the idea of bug school with Miss Bumblebee! 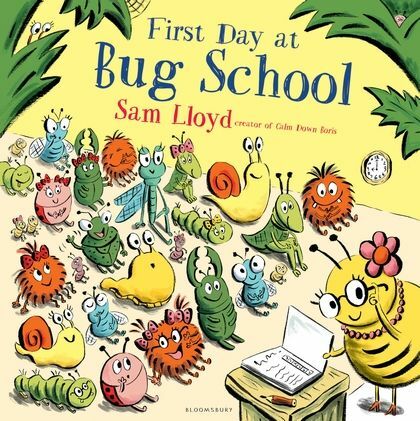 The story takes us through a school day at Bug School. It is a day which is very similar in terms of the activities which might happen in a conventional school. What makes Bug School so brilliant is that some of the characters are a little bit typecast. For example Sylvester snail is very slow in the toilet. This proved really amusing for little Ned. This is a book which really works for small children just about to start school as it shows them what to expect in a fun way. There is also plenty of value in there as the illustrations have lots of brilliant bits of detail to discuss. An excellent read which is well worth getting hold of for the start of your child’s school journey or to get your children thinking about being back to school. Find out more here and download an activity pack!